Doctor Daniel - Kids play “Doctor Daniel” with toy versions of the instruments pediatricians use. When children play “doctor,” they’re in charge – making it easier to manage a real-life visit when they have to be the patient. Daniel’s Bedtime - Children help Daniel go through the motions of getting ready to go to sleep. Kids can think about their own bedtime routines and the things that help them get ready for bed as they help Daniel. In Daniel’s Bathroom - Kids wash, brush and flush with Daniel during his bathroom routine. Children can practice and become familiar with their own bathroom routines. The DANIEL TIGER’S NEIGHBORHOOD: Play at Home with Daniel App is available for $1.99 for iPhone, iPad and iPod touch. The app can be downloaded from the App Store on iPhone, iPod touch and iPad, or at www.itunes.com/appstore. PBS KIDS has 19 apps available in the App Store, designed to help kids build literacy, math, science and school readiness skills and more. With a cross-platform approach, PBS KIDS is increasingly serving children and families across America wherever they live, learn and play. More information about PBS KIDS’ apps is available on pbskids.org/mobile. 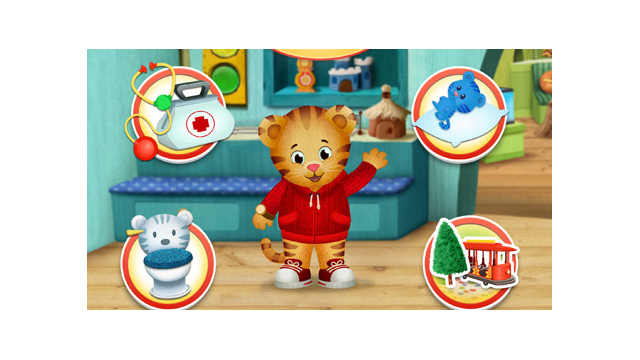 Images of DANIEL TIGER’S NEIGHBORHOOD: Play at Home with Daniel App can be found on PBS PressRoom. About DANIEL TIGER’S NEIGHBORHOOD The first TV series inspired by the iconic, award-winning MISTER ROGERS' NEIGHBORHOOD, DANIEL TIGER'S NEIGHBORHOOD from The Fred Rogers Company stars 4-year-old Daniel Tiger, son of the original program’s Daniel Striped Tiger, who invites young viewers into his world, giving them a kid’s-eye view of his life. As they closely follow and share Daniel’s everyday adventures, preschoolers ages 2-4 and their families learn fun and practical strategies and skills necessary for growing and learning.